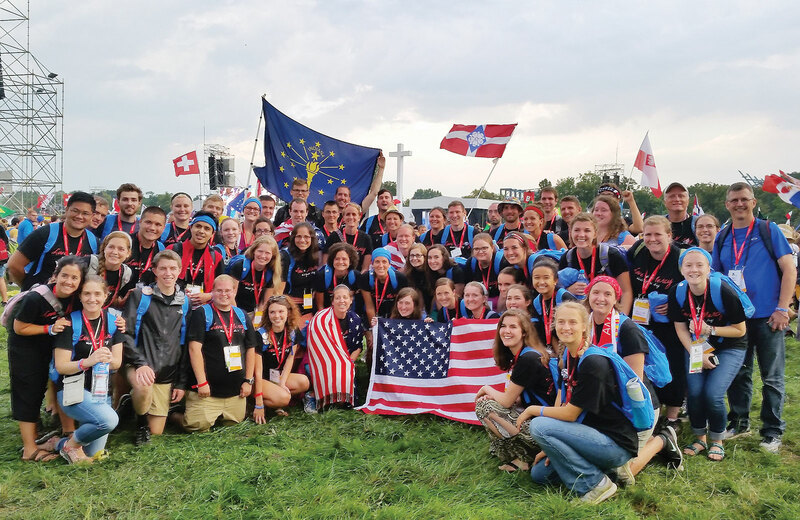 Following the closing Mass of World Youth Day in Poland with Pope Francis on July 31, some young people from the Archdiocese of Indianapolis walked more than eight miles—in the rain—to get back to their buses. When they arrived at the airport in Prague to begin their return flight to Indianapolis, 35 young adults from the archdiocese learned that their connecting flight to Paris had been canceled and rescheduled for a day later because of a strike by employees of Air France airlines. Yet despite such setbacks and struggles, the enduring memories of World Youth Day for the 104 youths and 64 young adults from the archdiocese are marked by the “spirit of peace and joy” that prevailed during the seven days at the end of July—when more than 1.6 million young people from around the world came together to celebrate and deepen their Catholic faith. Father Augenstein was among six priests from the archdiocese who concelebrated the closing Mass with Pope Francis. The others were Fathers Dustin Boehm, John Hollowell, Jonathan Meyer, Martin Rodriguez, and Dominican Father Raymond-Marie Bryce. “The first line of Pope Francis’ homily struck me the most,” Father Augenstein recalled. “He said that we have all come to Krakow to encounter Jesus Christ. We might be tempted to think that we were there to encounter the Holy Father, or the many saints of Krakow—like St. John Paul II and St. Faustina —or the young people gathered from all over the world. But those encounters were only significant and lasting if they led us to encounter Jesus Christ. The closing Mass was “a poignant reminder of what heaven is,” according to Father Hollowell, who led 26 youths from Annunciation Parish in Brazil and St. Paul the Apostle Parish in Greencastle to World Youth Day. Father Hollowell recalled some of the defining experiences for the group in the last 24 hours of World Youth Day—“walking in for five miles as the crowds continue to grow, spending a night in the field in a vigil of adoration and song, and then waking up and having Mass with Pope Francis—with people and flags as far as you can see in every direction. 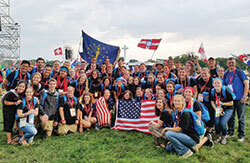 The experiences of the closing weekend had a lasting impact on the young pilgrims from the archdiocese. Catherine Fleszewski will always remember the feeling she had during eucharistic adoration at the Saturday night vigil. Scott Williams also recalled the beauty of that scene, even with all the hardships of walking for eight hours to arrive at the field where everyone converged for the Saturday night vigil and the Sunday morning Mass with Pope Francis. “It was a beautiful reminder that in life there will be some suffering along the way, but we are all in it together,” said Williams, coordinator of youth ministry for the archdiocese. Sunday’s Mass was just as powerful. Katie Sahm recalled another “beautiful moment” from earlier in the week when Father Augenstein led a small group of young adults from the archdiocese on a walking tour of the life of St. John Paul II. “We visited the house that he and his father lived in when they moved to Krakow,” said Sahm, associate director of the archdiocese’s Office of Young Adult and College Campus Ministry. “These were very formative years for St. John Paul since he was a young adult at the time and discovering his priesthood. It was also a time when he lost his dad. The 104 youths from the archdiocese also had a memorable moment early in the week when their pilgrimage led them to Rome, where Archbishop Joseph W. Tobin was visiting at the same time on official Vatican business. Archbishop Tobin celebrated Mass with the youths near the tomb of St. Peter in St. Peter’s Basilica. “Having our chief shepherd with us to celebrate Mass in St. Peter’s had a profound impact on them,” said Father Meyer, who led 34 young people from All Saints Parish in Dearborn County on the pilgrimage. He also won’t forget the example of one of the youths from All Saints as they walked miles to the open field on a day when the sun blazed, there was no shade, and temperatures rose to 90 degrees. Combine such moments with the memories of the Mass with Pope Francis and the World Youth Day theme of “Blessed are the Merciful,” and the impact on the pilgrims from the archdiocese is life-changing, say two local leaders of the journey.